Painted in tropical colours of lime green and mauve, this charming cottage has a view of Settlement Creek and is 100 feet from the public dock. Includes a golf cart to explore the island, drive to one of our beautiful beaches or drive to the many local restaurants and sample Bahamian cooking at it's best. The screened in deck off the kitchen is surrounded by lush native foliage and flowers offering privacy for morning coffee or a peaceful place to read a book and listen to the birds. My wife and I just had a great week on Green Turtle Cay, enjoying the amenities of the town of New Plymouth. We last visited by boat in 1992, and found the town largely unchanged and as charming as ever. 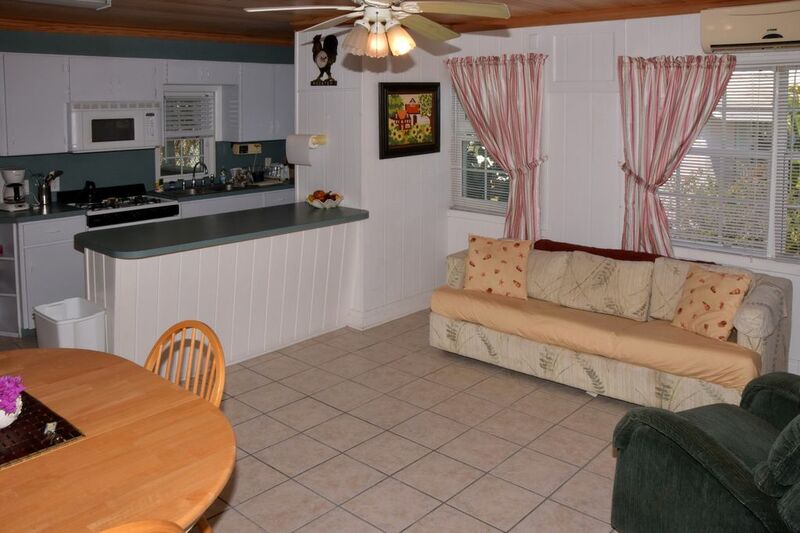 Shorty's Cottage is steps from the Town Dock and the Ferry Dock, so access is easy. The house has all the mod cons, including a washer/dryer. The town is very quiet and peaceful. There are four grocery stores within a short walk, and plenty of bars and restaurants. A golf cart comes with the rental, so you can drive all over the island, visiting the great beaches and resorts. A wonderful place. We loved this cottage. It is well laid out, well equipped, comfortable and clean. It's right in town, so it's walkable to restaurants, groceries, the Albert Lowe museum, gift shops and the ferry. The golf cart made it easy to explore the island. The town of New Plymouth is charming, the beaches and harbors are beautiful, the people are very friendly and helpful. Wonderful stay at Shorty’s Cottage. Marilyn was very helpful. Great staying in New Plymouth near most of the restaurants and stores. Enjoyed the included golf cart for the week. Perfect in town location ! We thoroughly enjoyed our stay and Shorty’s cottage. The home is central to everything and close enough to the waterfront to see a the daily activity from the front porch. We would highly recommend !